For years Chuck Norris and Christie Brinkley have been selling a machine called the Total Gym, a machine that uses gravity and your body weight to deliver over 80 exercises. It seems to be working miracles for them, so why not another gravity-based trainer? Vasa offers the Vasa Trainer, which, like the Total Gym, works by lifting your body weight up an inclined monorail and then lowering it back down. 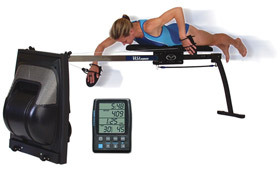 Vasa also offers a wind resistance unit called the Vasa Ergometer. Both devices are marketed towards swimmers, paddlers and surfers and have adapter kits to serve those respective users. There are a lot of immediate and obvious benefits to a Vasa Trainer. Firstly, training anytime, anywhere is not always easy for swimmers, surfers, triathletes or paddlers who don’t live in San Diego. You need unfrozen water and I for one seem to be running out of that resource where I live in the North East. Vasa trainers also allow coaches to talk to their swimmers and see mechanics that would otherwise be hidden underwater and by churn. It’s also reported that the Vasa units require less time to train and can develop power and endurance in about half the time than in the water. If you’re serious about swimming, paddling or staying in shape for long surfing sessions, then have a look at the Vasa web site and consider getting one of these trainers.